Memory with moving parts: "Drives"
Although many textbooks provide good introductions to digital memory technology, I intend to make this chapter unique in presenting both past and present technologies to some degree of detail. While many of these memory designs are obsolete, their foundational principles are still quite interesting and educational, and may even find re-application in the memory technologies of the future. The basic goal of digital memory is to provide a means to store and access binary data: sequences of 1's and 0's. The digital storage of information holds advantages over analog techniques much the same as digital communication of information holds advantages over analog communication. This is not to say that digital data storage is unequivocally superior to analog, but it does address some of the more common problems associated with analog techniques and thus finds immense popularity in both consumer and industrial applications. Digital data storage also complements digital computation technology well, and thus finds natural application in the world of computers. The most evident advantage of digital data storage is the resistance to corruption. Suppose that we were going to store a piece of data regarding the magnitude of a voltage signal by means of magnetizing a small chunk of magnetic material. Since many magnetic materials retain their strength of magnetization very well over time, this would be a logical media candidate for long-term storage of this particular data (in fact, this is precisely how audio and video tape technology works: thin plastic tape is impregnated with particles of iron-oxide material, which can be magnetized or demagnetized via the application of a magnetic field from an electromagnet coil. The data is then retrieved from the tape by moving the magnetized tape past another coil of wire, the magnetized spots on the tape inducing voltage in that coil, reproducing the voltage waveform initially used to magnetize the tape). If we represent an analog signal by the strength of magnetization on spots of the tape, the storage of data on the tape will be susceptible to the smallest degree of degradation of that magnetization. As the tape ages and the magnetization fades, the analog signal magnitude represented on the tape will appear to be less than what it was when we first recorded the data. Also, if any spurious magnetic fields happen to alter the magnetization on the tape, even if it's only by a small amount, that altering of field strength will be interpreted upon re-play as an altering (or corruption) of the signal that was recorded. Since analog signals have infinite resolution, the smallest degree of change will have an impact on the integrity of the data storage. If we were to use that same tape and store the data in binary digital form, however, the strength of magnetization on the tape would fall into two discrete levels: "high" and "low," with no valid in-between states. As the tape aged or was exposed to spurious magnetic fields, those same locations on the tape would experience slight alteration of magnetic field strength, but unless the alterations were extreme, no data corruption would occur upon re-play of the tape. By reducing the resolution of the signal impressed upon the magnetic tape, we've gained significant immunity to the kind of degradation and "noise" typically plaguing stored analog data. On the other hand, our data resolution would be limited to the scanning rate and the number of bits output by the A/D converter which interpreted the original analog signal, so the reproduction wouldn't necessarily be "better" than with analog, merely more rugged. With the advanced technology of modern A/D's, though, the tradeoff is acceptable for most applications. Also, by encoding different types of data into specific binary number schemes, digital storage allows us to archive a wide variety of information that is often difficult to encode in analog form. Text, for example, is represented quite easily with the binary ASCII code, seven bits for each character, including punctuation marks, spaces, and carriage returns. A wider range of text is encoded using the Unicode standard, in like manner. Any kind of numerical data can be represented using binary notation on digital media, and any kind of information that can be encoded in numerical form (which almost any kind can!) is storable, too. 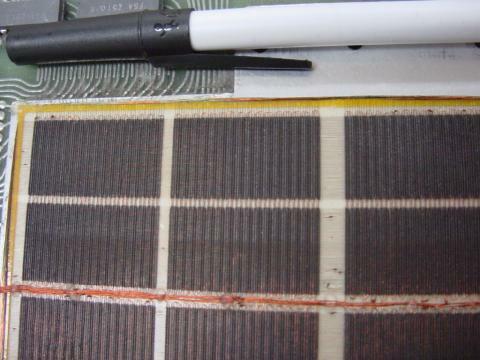 Techniques such as parity and checksum error detection can be employed to further guard against data corruption, in ways that analog does not lend itself to. 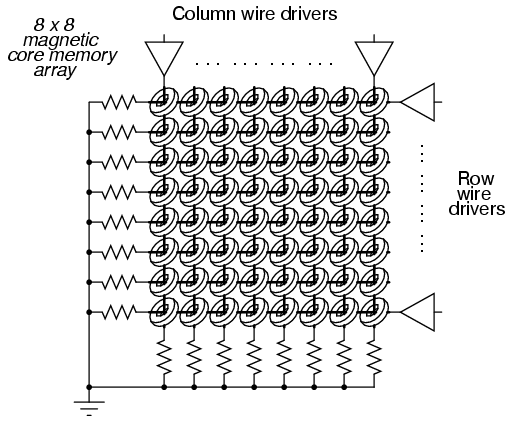 With some types of memory devices, the address in which certain data is stored can be called up by means of parallel data lines in a digital circuit (we'll discuss this in more detail later in this lesson). With other types of devices, data is addressed in terms of an actual physical location on the surface of some type of media (the tracks and sectors of circular computer disks, for instance). However, some memory devices such as magnetic tapes have a one-dimensional type of data addressing: if you want to play your favorite song in the middle of a cassette tape album, you have to fast-forward to that spot in the tape, arriving at the proper spot by means of trial-and-error, judging the approximate area by means of a counter that keeps track of tape position, and/or by the amount of time it takes to get there from the beginning of the tape. The access of data from a storage device falls roughly into two categories: random access and sequential access. Random access means that you can quickly and precisely address a specific data location within the device, and non-random simply means that you cannot. A vinyl record platter is an example of a random-access device: to skip to any song, you just position the stylus arm at whatever location on the record that you want (compact audio disks so the same thing, only they do it automatically for you). Cassette tape, on the other hand, is sequential. You have to wait to go past the other songs in sequence before you can access or address the song that you want to skip to. Another distinction to be made for any particular memory technology is its volatility, or data storage permanence without power. 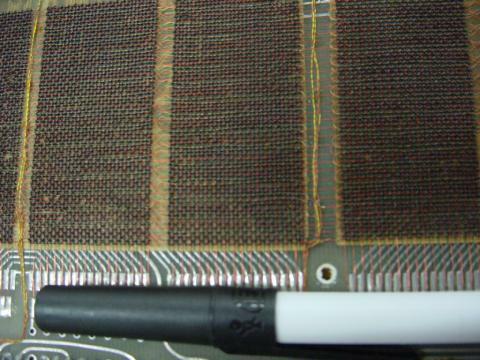 Many electronic memory devices store binary data by means of circuits that are either latched in a "high" or "low" state, and this latching effect holds only as long as electric power is maintained to those circuits. Such memory would be properly referred to as volatile. Storage media such as magnetized disk or tape is nonvolatile, because no source of power is needed to maintain data storage. This is often confusing for new students of computer technology, because the volatile electronic memory typically used for the construction of computer devices is commonly and distinctly referred to as RAM (Random Access Memory). While RAM memory is typically randomly-accessed, so is virtually every other kind of memory device in the computer! What "RAM" really refers to is the volatility of the memory, and not its mode of access. Nonvolatile memory integrated circuits in personal computers are commonly (and properly) referred to as ROM (Read-Only Memory), but their data contents are accessed randomly, just like the volatile memory circuits! 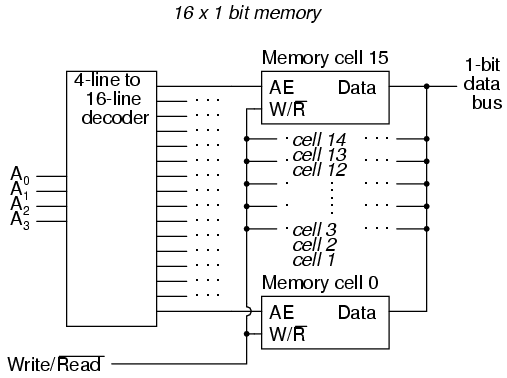 In the above circuit, 16 memory cells are individually addressed with a 4-bit binary code input into the decoder. If a cell is not addressed, it will be disconnected from the 1-bit data bus by its internal tristate buffers: consequently, data cannot be either written or read through the bus to or from that cell. Only the cell circuit that is addressed by the 4-bit decoder input will be accessible through the data bus. 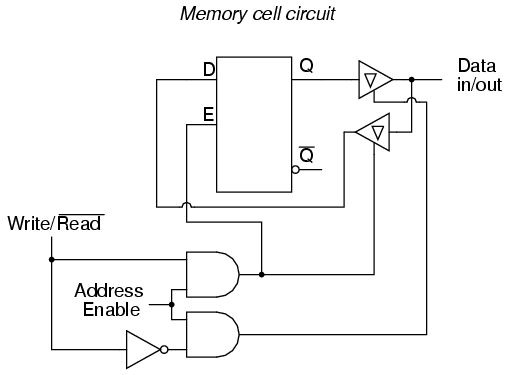 This simple memory circuit is random-access and volatile. Technically, it is known as a static RAM. Its total memory capacity is 16 bits. Since it contains 16 addresses and has a data bus that is 1 bit wide, it would be designated as a 16 x 1 bit static RAM circuit. As you can see, it takes an incredible number of gates (and multiple transistors per gate!) to construct a practical static RAM circuit. This makes the static RAM a relatively low-density device, with less capacity than most other types of RAM technology per unit IC chip space. Because each cell circuit consumes a certain amount of power, the overall power consumption for a large array of cells can be quite high. Early static RAM banks in personal computers consumed a fair amount of power and generated a lot of heat, too. CMOS IC technology has made it possible to lower the specific power consumption of static RAM circuits, but low storage density is still an issue. To address this, engineers turned to the capacitor instead of the bistable multivibrator as a means of storing binary data. A tiny capacitor could serve as a memory cell, complete with a single MOSFET transistor for connecting it to the data bus for charging (writing a 1), discharging (writing a 0), or reading. Unfortunately, such tiny capacitors have very small capacitances, and their charge tends to "leak" away through any circuit impedances quite rapidly. 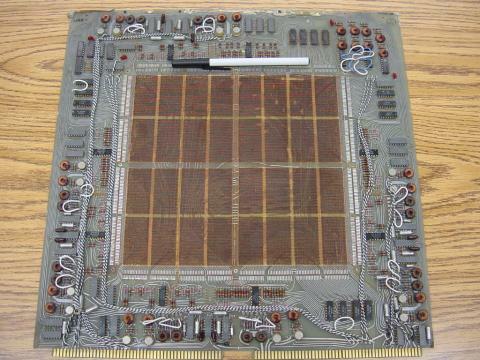 To combat this tendency, engineers designed circuits internal to the RAM memory chip which would periodically read all cells and recharge (or "refresh") the capacitors as needed. Although this added to the complexity of the circuit, it still required far less componentry than a RAM built of multivibrators. 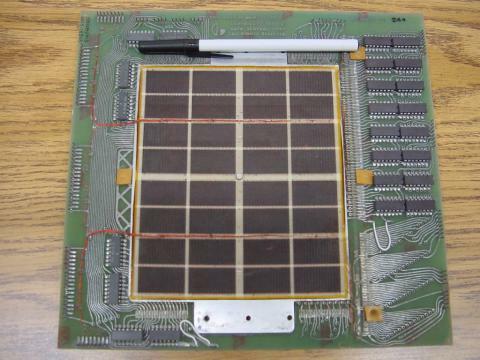 They called this type of memory circuit a dynamic RAM, because of its need of periodic refreshing. Recent advances in IC chip manufacturing has led to the introduction of flash memory, which works on a capacitive storage principle like the dynamic RAM, but uses the insulated gate of a MOSFET as the capacitor itself. The earliest forms of digital data storage involving moving parts was that of the punched paper card. Joseph Marie Jacquard invented a weaving loom in 1780 which automatically followed weaving instructions set by carefully placed holes in paper cards. This same technology was adapted to electronic computers in the 1950's, with the cards being read mechanically (metal-to-metal contact through the holes), pneumatically (air blown through the holes, the presence of a hole sensed by air nozzle backpressure), or optically (light shining through the holes). An improvement over paper cards is the paper tape, still used in some industrial environments (notably the CNC machine tool industry), where data storage and speed demands are low and ruggedness is highly valued. Instead of wood-fiber paper, mylar material is often used, with optical reading of the tape being the most popular method. Magnetic tape (very similar to audio or video cassette tape) was the next logical improvement in storage media. It is still widely used today, as a means to store "backup" data for archiving and emergency restoration for other, faster methods of data storage. Like paper tape, magnetic tape is sequential access, rather than random access. In early home computer systems, regular audio cassette tape was used to store data in modulated form, the binary 1's and 0's represented by different frequencies (similar to FSK data communication). Access speed was terribly slow (if you were reading ASCII text from the tape, you could almost keep up with the pace of the letters appearing on the computer's screen! ), but it was cheap and fairly reliable. Tape suffered the disadvantage of being sequential access. 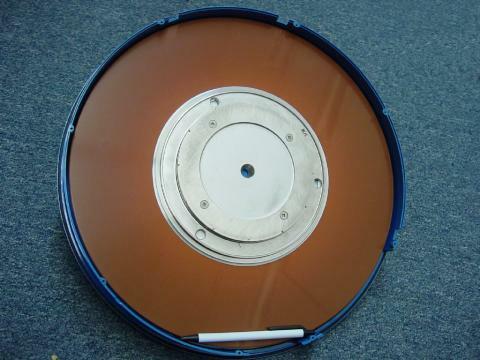 To address this weak point, magnetic storage "drives" with disk- or drum-shaped media were built. An electric motor provided constant-speed motion. A movable read/write coil (also known as a "head") was provided which could be positioned via servo-motors to various locations on the height of the drum or the radius of the disk, giving access that is almost random (you might still have to wait for the drum or disk to rotate to the proper position once the read/write coil has reached the right location). The disk shape lent itself best to portable media, and thus the floppy disk was born. Floppy disks (so-called because the magnetic media is thin and flexible) were originally made in 8-inch diameter formats. Later, the 5-1/4 inch variety was introduced, which was made practical by advances in media particle density. All things being equal, a larger disk has more space upon which to write data. 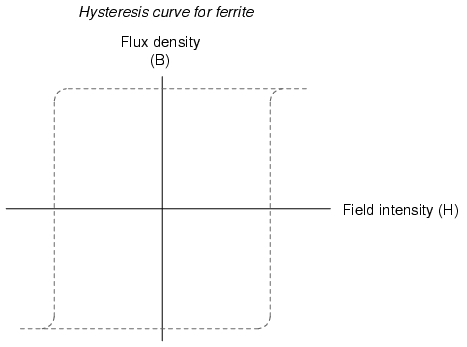 However, storage density can be improved by making the little grains of iron-oxide material on the disk substrate smaller. Today, the 3-1/2 inch floppy disk is the preeminent format, with a capacity of 1.44 Mbytes (2.88 Mbytes on SCSI drives). Other portable drive formats are becoming popular, with IoMega's 100 Mbyte "ZIP" and 1 Gbyte "JAZ" disks appearing as original equipment on some personal computers. Still, floppy drives have the disadvantage of being exposed to harsh environments, being constantly removed from the drive mechanism which reads, writes, and spins the media. The first disks were enclosed units, sealed from all dust and other particulate matter, and were definitely not portable. Keeping the media in an enclosed environment allowed engineers to avoid dust altogether, as well as spurious magnetic fields. This, in turn, allowed for much closer spacing between the head and the magnetic material, resulting in a much tighter-focused magnetic field to write data to the magnetic material. 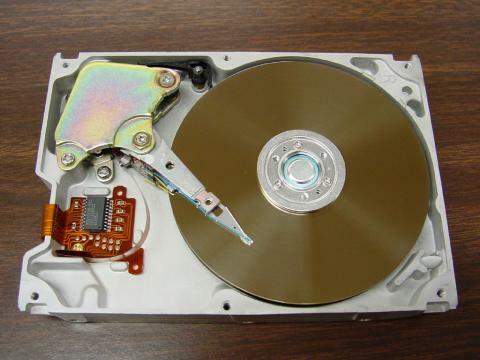 Modern disk drives use multiple platters made of hard material (hence the name, "hard drive") with multiple read/write heads for every platter. The gap between head and platter is much smaller than the diameter of a human hair. If the hermetically-sealed environment inside a hard disk drive is contaminated with outside air, the hard drive will be rendered useless. Dust will lodge between the heads and the platters, causing damage to the surface of the media. An incentive for digital data storage technology advancement was the advent of digitally encoded music. A joint venture between Sony and Phillips resulted in the release of the "compact audio disk" (CD) to the public in the late 1980's. This technology is a read-only type, the media being a thin film of aluminum foil embedded in a transparent plastic disk. Binary bits are "burned" into the aluminum as pits by a high-power laser. Data is read by a low-power laser (the beam of which can be focused more precisely than normal light) reflecting off the aluminum to a photocell receiver. The advantages of CDs over magnetic tape are legion. Being digital, the information is highly resistant to corruption. Being non-contact in operation, there is no wear incurred through playing. Being optical, they are immune to magnetic fields (which can easily corrupt data on magnetic tape or disks). It is possible to purchase CD "burner" drives which contain the high-power laser necessary to write to a blank disk. Following on the heels of the music industry, the video entertainment industry has leveraged the technology of optical storage with the introduction of the Digital Video Disk, or DVD. Using a similar-sized plastic disk as the music CD, a DVD employs closer spacing of pits to achieve much greater storage density. This increased density allows feature-length movies to be encoded on DVD media, complete with trivia information about the movie, director's notes, and so on. Much effort is being directed toward the development of practical read/write optical disks (CD-W). Success has been found in using chemical substances whose color may be changed through exposure to bright laser light, then "read" by lower-intensity light. These optical disks are immediately identified by their characteristically colored surfaces, as opposed to the silver-colored underside of a standard CD.